Ávila is a town located in west-central Spain, 67 miles (110 km) northwest of Madrid. The town is a UNESCO World Heritage Site known for prominent and well-preserved medieval town walls and many churches. With 82 semicircular towers and nine gates, the city walls are the most complete in Spain. Avila’s most famous building is a majestic cathedral that is built into those walls. The city is built on the flat summit of a rocky outcrop at 3,714 ft (1,132 m), standing high above the surrounding landscape and visible from a distance. Camino Viejo offers accommodation in Avila. La Viña Park is 200 metres from the property. The accommodation features a seating area. Some units feature a dining area and/or terrace. Average score from 10 guest reviews: 8.1/10. 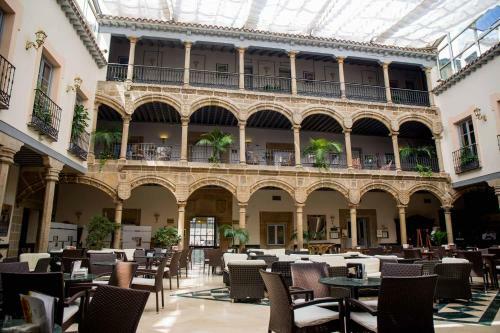 The lovely El Rastro Hotel has an ideal location within the city’s ancient walls. 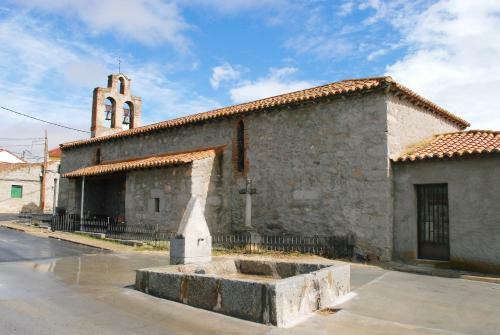 It is close to the Rastro Arch and the birth house of Santa Teresa with its museum. Average score from 760 guest reviews: 8.2/10. Everything was great. Right next to the Wall of Avila. Parking near. Difficult to find but just park outside the gate to the city and go right when you go through and it is 100 metres in front of you. Very convenient to walk the city and the city walls which are stunning at night. Pleased that the hotel still takes dogs because the "dog room" we were in, and we don't mind, had been ruined by someones dog. Furniture chewed and ruined. The hotel have done their best to cover it but shame on the owner! Ate at Meson del Rastro restaurant just round the corner which was excellent. Taster menu for two which included starters a tbone steak and puddings for 39 euros - a nice bottle of wine and some water and the bill was just under 50 euros and the ambience of stags antlers and beams everywhere..brilliant. Local people really helpful, told me where to park, what to eat, what to see in my very limited timescale. Needed more time, will go back! Very good value for money, excellent rooms and service for a much cheaper price than other hotels in Avila. Great location in the heart of the old city. Comfortable and good value. Interesting building and location. Proper matrimonial bed. The full board is a great experience as Breakfast is in a bar around the corner and dinner is in the courtyard out the front with an Italien menu .Yummy tiramisu! The location, welcome, and well equipped clean room. Located in Avila's old town, between the picturesque St Vincent's Basilica and the old city walls, this hotel offers free wired internet throughout. Air-conditioned rooms offer stunning views of the basilica, city walls and old town. Average score from 900 guest reviews: 8.1/10. Proximity to walls and friendly and helpful staff. Amazing location, just by the city walls. Huge room, very clean, nice staff. Excellent value for money. You can park in the street (green zone) for just 1 euro a day! The hotel was easy to find, directly opposite the city walls. Parking was nearby and although public it was only 1euro for 24hours. Location right outside the old town walls, friendly helpful staff, restaurant just outside, garage space, clean and quiet. The location was excellent, and having secure parking was a great bonus. Great location, just across from town walls gate. Next door to the Basilica. Secure parking for our motorcycle under the hotel. Strong Wifi. Great views from Bedroom. Blackout shutters worked well. 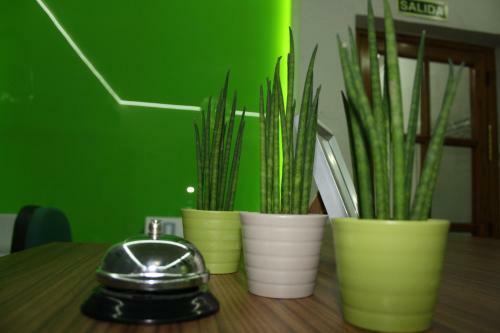 The staff were all extremely pleasant and helpful in this simple yet delightful hotel. Set in an impressive 16th-century palace, the Palacio de los Velada offers luxurious rooms with elegant furnishings and air conditioning. A beautiful arched gallery surrounds the bright, central courtyard. Average score from 16 guest reviews: 8.6/10. Wonderful hotel in exactly the right spot. Staff were super helpful and gracious. beautiful location, very well appointed hotel. Would definitely return. Buffet breakfast was really tasty and rooms spacious. Best location in a beautiful historic area of Avila. Hotel had a garage, was centrally located and very comfortable. Large bathroom, clean, large room, french doors for fresh air, excellent location, beautiful courtyard, friendly and accommodating staff. The most beautiful and wonderful hotel in Avila. Perfectly located beside the cathedral. Set within Avila's Medieval walls, this recently renovated, 16th-century guesthouse boasts rustic charm and a fabulously authentic restaurant. The guesthouse's design remains faithful to the delightful architecture of the Rastro's original... Average score from 386 guest reviews: 8.3/10. We were moved to the hotel Rastro, which was lovely, no extra charge, staff helpful, just across the street. Had character. Beautiful view from the bedroom and fantastic location. Friendly and helpful staff. Amazing shower! Excellent location to visit the city. The room was very nice with a castillan style. The restaurant nearby was excellent. They have the restaurant, so you can eat at there and they lend us glass. Large room and comfortable bed. Near old town. Good equipment. Just inside the walls, but not the picture shownin the advert. The Hostal is just round the corner in a very quiet square. They did nort sem to do breakfast. Second and third nights were 10€ less than first night. Walking out of the hostal straight into the heart of the town . The restaurant is comunicated internally with the hostal. The location is great and the view is simply amazing!!! Good location. Big rooms in converted historic house inside the walls. Easy walk to all attractions. 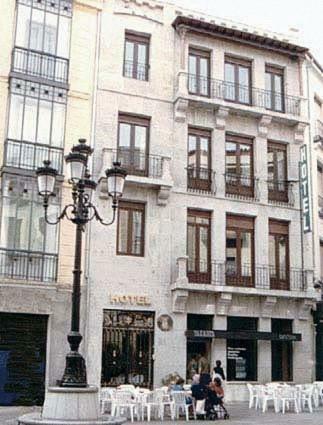 The hostal is located in a building of historical interest, right next to a city gate. The roast pig meal seems to be famous. The room is fairly nice and the bathroom is modern and quite spacious for a simple hostal. See all hotels in Avila. Mistic Hostel is located in Avila, 200 metres from Lienzo Norte Conference Centre. A flat-screen TV, as well as a laptop are offered. A balcony or patio are featured in certain rooms. Mistic Hostel features free WiFi throughout the property. Average score from 315 guest reviews: 9.5/10. All you can expect from an excellent hostel with the bonus of a wonderful host. Everything is in excellent condition, room is big, with wardrobe, toilets next door always clean, kitchen as you would dream to have, living room with sofas and games. Just perfect. Thanks a lot Sílvia for the wonderful attention. Hostess/owner was so so kind. Beautiful kitchen and bathroom. Beds were basic. Cleanest hostel I have ever been in . impeccable.about 20 mins walk from centre. Very quiet residential area. Sylvia is just such a friendly person! She showed me lots of stuff to see around Avila (which is very tranquil but still very interesting and mysterious)... also, the kitchen and the common room are amazing, i felt very much at home! One of the best hostels I have stayed in. The lady working there was very knowledgeable of the town and where to get the best food for the value. The place is very clean and the kitchen is great. The room was a bit small but it was very comfortable and clean! Our private room was very cheap too. The location was also perfect as it was in the old walled city. The cathedral was only a few minutes away by foot. A wonderful hostel. It was clean, spacious and had a fantastic vibe. There was everything you could possibly need. The huge beautiful kitchen was fantastic. Clean comfortable bedrooms and great clean bathrooms also. Our host was so friendly and has a wealth of knowledge on the area (Spanish speaker). I would absolutely stay here again and recommend it to anyone. Good location, walking distance to all of the old town and a short cab ride from the train station. The property was from the outset, very clean, tidy and organised. We were given plenty of information about the town which was useful. The kitchen and patio were very pleasant to use, the breakfast was plentiful and facilities were convenient, practical, exactly what a traveller needs. Beds were comfortable and the room an adequate size, 4 people for 2 nights. Bathroom had clean and practical shower and toilet facilities. Overall we were each very happy with our stay. The best and most up to date hostal I stayed in Spain. Just like staying in a very nice house. The woman running the business is super welcoming and really cool. Very helpful, friendly and efficient lady who runs the hostal. Everything was PERFECT. Room and bathroom were spotlessly clean. Kitchen was well equipped kitchenware were new. Everything was nicely organized in the kitchen. The owner was super friendly and helpful. BOOK THIS HOTEL NOWSee all hotels in Avila. Featuring free WiFi throughout the property, Hostal Doña Juana is set in Avila, 200 metres from Castilla y Leon Tourism Office. Every room has a flat-screen TV. The rooms have a private bathroom fitted with a bath or shower. Average score from 743 guest reviews: 9.4/10. Very polite and helpful host, good internet, perfect location, good price. A little gem of a place in a super position, a few metres from the centre of Avila, yet very quiet. Very simple, but clean, comfortable and airy. Opened in early 2016 after complete refurbishment so bathrooms are smart and modern and furniture is new. Very helpful staff. 1. Perfect location. 2. Super nice staffs--not only took us to the parking lot, but also told us the places to eat just for local people. 3. Absolutely brand new and spacious room which is even in higher quality compare with most of 3 stars hotel!! Very good location! Very comfortable room and perfect shower! Excellent value. Everything is new and very clean, there's an elevator, my room had a balcony and the location is unbeatable. All this for less than €25. Huge recommendation. This is a little gem in the heart of Avila, you will not be disappointed, you need to use the underground car park which is close by and well sign posted the walk to the hotel.The staff excellent English speaking. Great room and shower. Quiet yet only 2 minutes from the main square. Nice staff who put up with my very bad Spanish! Hotel is literally 5mins from the walled town of Avila...perfect. Excellent Position. New fornitures. Cosy bathroom. Gentle people. Good Wi-Fi. The rooms were very clean and the personnel very kind and helpful. The location is nearby all the hotspots in Avila. Located within Ávila’s old city walls, a UNESCO heritage site, Le Vintage is beside the town hall and cathedral. It offers free WiFi and modern rooms. All stylish, heated rooms come with a flat-screen TV and a minibar with 1 free bottle of water. Average score from 803 guest reviews: 8.8/10. Fantastic location. Really lovely interior décoration and clean. The hotel had great character. Very friendly and helpful staff. Perfect location right next to the plaza mayor but still quiet. You have good tapas bars across the street. The interior had a personal touch which we liked. Staff was very friendly and you get good value for a very good price. Everything is in short walking distance. Great place to experience the Semana Santa. Excelente trato e indicaciones de los encargados. Simplemente felicitarles por todo. La ubicación excelente, la habitación amplia y con espacio. Avila, un descubrimiento. volveremos!! O espaço é muito agradável e com bom gosto. E soube muito bem o pequeno-almoço antes de começar a visita à cidade. La cama era comodísima, el sitio recien reformado estaba precioso, el desayuno muy bueno. Habitacion amplia. Deayuno normal, pero suficiente. Hotel muy centrico dentro de las murallas de Avila, bien comunicado, el coche hay que dejarlo en los parkings fuera de murallas, 5 minutos andando hasta el hotel. Recepcion muy amables. Très bonne surprise que cet hostal si peu cher ! Le personnel est très sympathique, la chambre agréable, la situation idéale... Tout était super ! Le restaurant recommandé par l'hôtel est également très bien. No centro de Ávila, bem localizado. Com um ambiente muito familiar e agradável. Simplemente decir que Le Vintage es recomendable 100% tanto por calidad como por precio,he estado con mi pareja esta pasada semana santa y nos hemos ido muy contentos, amabilidad y muy buen trato,su ubicación prácticamente en el centro del casco antiguo, acertamos de pleno. Situated in the heart of Ávila, the hotel lies in the medieval centre, with its enchanting narrow streets, cathedral and the Plaza de Santa Teresa. The building blends in well with it’s the historical surroundings. Average score from 28 guest reviews: 8.7/10. Rooms were ample and very clean. The location is unbeatable. Staff is in general quite accommodating. The cleanliness throughout the hotel is surgically clean. A fantastic value and worth repeating! The room was spacious with two windows that opened onto small Juliette balconies. There was a table with two chairs for eating besides a large desk for the computer (but needed an extra electrical outlet.) The hotel is well located inside the city wall and is very convenient for sightseeing. Because of problems with a lost and found passport I arrived at 3.30 in the morning. I was tired, but one of the staff went with me in the car to show me where to park, he even paid my parking for 2 days (I noticed later on). Then he walked with me through Avila back to the hotel. That is service !! Nice room, everything there, everything worked, quiet, I slept wonderfully. The location is perfect. I didn't have breakfast because my favourite desayuno is churros y cafe con leche. But there are plenty of restaurants nearby. I only stayed two nights, but I didn't want to go actually. I will certainly come back to this hotel whenever I return to Avila. The rooms are spacious and clean, the beds are very comfortable and the location is great. Just brilliant. We travel a lot around Europe...This is one of the best hotel for this silly price... Top of the pick. I have never rated a hotel a 10. Las Moradas is the exception. Staff treats guests with upmost courtesy, respect, professional and friendly service. Situated smack in the middle of everything a tourist will visit and more. The room is excellent, spotless, bed very comfortable, big size TV, soft and thick bath towels, nice size room plenty of space. Quiet rooms, stayed 4 days. Recommend to all. Price to quality cannot be better. Overall a very surprising and pleasant 10. 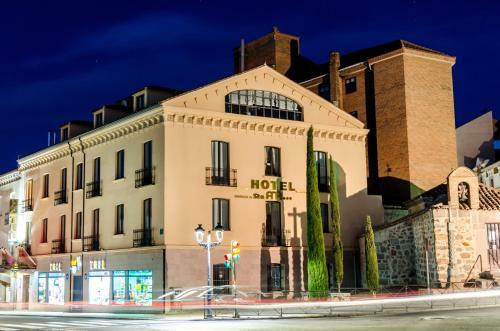 Situated in the historic centre of Ávila, this simple, value hotel is the ideal accommodation for a relaxing holiday in the region, or if you are visiting on business. Average score from 613 guest reviews: 8.6/10. staff was always friendly and helpful, communication in Spanish - breakfast very nice for little money , the room way more spacious than I had expected - just great ! We were very well received and the rooms were comfortable, with a good breakfast. Excellent value accomodation! Clean, quiet and located in the center of town. Daily housekeeping was very nice, and felt like we had lots of privacy. I liked the room - you have enough space. I also liked the room cleaning every day. Free WIFI very good signal. Spacy room and fair size bathroom, all very clean. Friendly and helpful staff, guiding me to a free parking area at walking distance. Incredible value for money. Beautifull old building inside the citywalls. Highly recommended. Great location. Nice spacious rooms and bathrooms. Heated rooms (in April it is necessary). Parking along the street is possible a few streets further for free. Llegamos antes de la hora de checking y se nos guardó el equipaje hasta que decidimos volver para hacer el mismo. La ubicación de 10. La habitación muy amplia y limpia. Con un armario empotrado grande, una mesa con dos sillas y una cama con sus respectivas mesillas. He de decir que me sorprendió la comodidad de la cama y de su almohada. El baño grande, limpio y hasta con bidé. El agua caliente de cine. Y la calefacción funcionaba intermitentemente, lo suficiente para que en la habitación pese al frío exterior se estuviera confortable. Nos decantamos por desayunar en el hostal y su pequeño desayuno buffet cumple con nota. No quiero desaprovechar la ocasión para agradecerle a Narciso su amabilidad y hospitalidad, ya que nos sentimos como en casa. Sin duda un gran descubrimiento y cuando volvamos por Ávila, sin duda repetiremos. 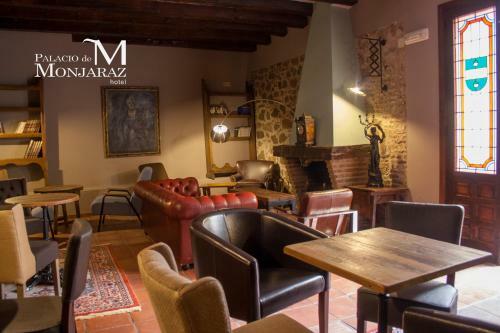 Situated in Avila's Old Town, just 300 metres from the Cathedral, Palacio de Monjaraz hotel is a renovated 16th-century building of traditional stone construction. Free WiFi is available. Average score from 24 guest reviews: 8.5/10. We liked the comfortable bed, the decor and cleanliness and of course the location. Also the very helpful and informative member of staff. Proper old-fashioned palacio within the city walls, renovated to an exceptional standard. This was my third visit to Ávila and I now know where I'll be staying on future visits. Parking close by (not free, but hey, you're in a UNESCO World Heritage City) and a couple of the city's best eateries within a few metres, plus only a few minutes walk to the main plaza, the cathedral, etc. Felt regal. Staff was helpful and accommodating. Breakfast was good, and the location is great. I'm coming back! We love everything beginning with warming greetings, professional, the price, clean, comfort. Peter and Nieves was very very professional and show all times the good manners to help and tell us about the property. In the old part of town, lovely location, beautiful hotel, great value, staff very helpful. Amazing location - historic building within the walled city. We had a family room which could very comfortably sleep 5. Superb value! A beautiful hostal, well situated in the old town. Clean, comfortable and full of character. The WiFi worked well. Excellent value for money. 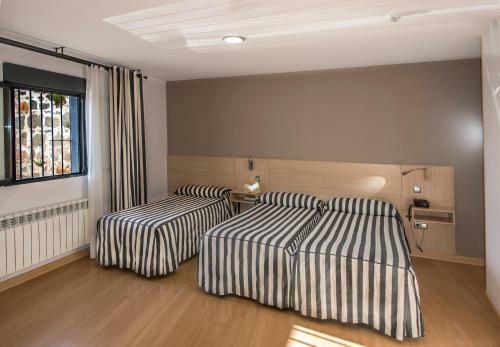 Located in Ávila Railway Station, Hostal La Estación features heated rooms with free Wi-Fi and simple décor. There is a bus station to the old town 700 metres away. Each simple room is fitted with a wardrobe, desk and a fan. Average score from 700 guest reviews: 8.3/10. Location is a short walk to the centre of the city / town. Near local tapas bars where the locals drink and eat. Clean and fresh.Beside bus and train station. It is part of the railway station just above the station restaurant. Close to Avila's old walls.There is no sound of trains because of the effective window glazing (double). Room was big with self contained bath/shower. Great value for money, very clean, good Wi-Fi, friendly staff, and all the rest you need in a hostal like that. Train sounds are no problem at all, at least in the 'outer' part of the hostal, where windows are facing the street. I loved this place. I originally chose it for convenience, because I was both arriving and departing by train. My room was huge, with two beds, two dressers, a large armoire, a large table, two chairs, and a footstool. It had windows on two sides, one of which was filled with lovely geraniums. It was hot and there was no air conditioning, but they put a fan in my room and I was very comfortable. The bathroom was also huge, with a large tub and shower. I thought it was adorable. I could hardly hear the trains at all, and they did not run late. Bonus: there is a churerria about 100 feet away. Train station on your door step and bus station a 3 minute walk away. Perfect wifi, friendly staff, clean and good heating. Location (close to the bus station, train station). Well equipped accommodation, towel, shower gel, shampoo included (there is no hairdryer), clean room. The hotel, placed in the same building of the train station, is clean and tidy. 30 seconds (just go downstairs) to the train station, about 5 minutes to the bus station (quite abandoned and with maniac-like characters inside). 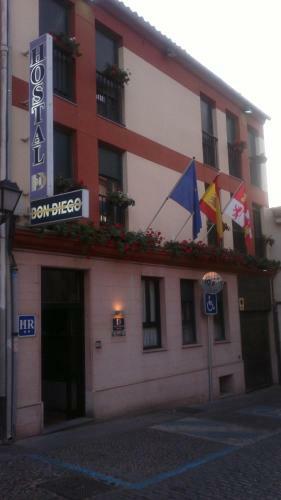 Hostal Don Diego is centrally located 100 metres inside Avila’s historic walls, and 5 minutes’ walk from the cathedral. It offers rooms with free Wi-Fi and private bathrooms. Average score from 51 guest reviews: 8.1/10. The hotel has a great situation in the historic town, it also has a kitchen which may be used by residents, a big plus for anyone travelling on a budget, plus there is an outside seating area. Location, quiet big room, excellent shower, friendly staff. Good reasonable price. The staff were really helpful and friendly. The location is great right at the old town.The bed was extremely comfy and the room was warm despite the cold temperature outside. Just a few hundred metres from the old part of town. Inside the city walls. Comfortable room, lovely decor throughout the hostal. Opposite Parador. Secure parking right next door for an extra €10. Small room and bathroom, but all you need. Clean, comfortable. Very friendly, helpful staff. Comfortable beds. Lovely and warm! A very pleasant hostal located inside the walls and within easy walking distance of the cathedral etc. Staff were extremely helpful and friendly. I do wish they had informed me how to open the garage door so I could have recovered my car in the morning as this delayed me for over an hour. Clean and well appointed and very good value for money. Thoughtfully modernized room with elevator right to the door. Heating on cold evenings. Fast hot water. Comfortable bed. It has great price. The room was clean and the bed was comfortable. The staff is really friendly. She explain us in 3 minutes the most important things to visit in Avila. It is very good located. Quiet, friendly staff, excellent shower.Good wardrobe space & hangers. Elevator!!! Bath!!! Bed!!! Everything was fine!!! This charming 17th-century building is set in front of Ávila's city walls, offering views of the cathedral. The hotel has been renovated, retaining its charm mixed with modern amenities. Average score from 52 guest reviews: 8.1/10. Location. Clean good sized room. Helpful staff. We liked everything about this property. Friendly receptionist, very helpful too. 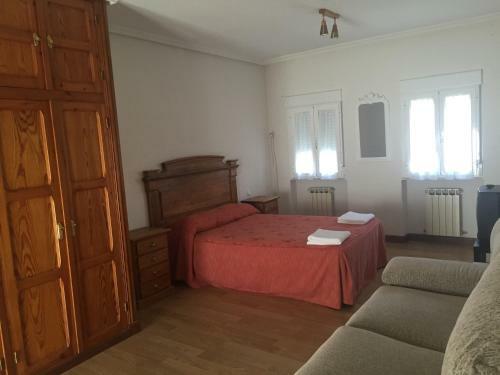 Good big room, warm on freezing nights in superb position opposite the town walls and the Puerta. This little Hotel has the most amazing view of the Cathedral & walls it is well worth booking a room with a view! The food is very good we enjoyed the terrace bar & menue very good value highly recommend this small hotel helpful & friendly staff. Ideal location for the cathedral and walls. Breakfast was excellent value for money - no restriction on food and drinks options. Location was wonderful. Evening receptionist was most helpful and pleasant. Very good value. Set within Avila’s city walls, Hostal Alcántara is close to Avila’s Cathedral, the Town Hall and San Vicente Basilica. It offers free Wi-Fi and has a restaurant serving traditional dishes of the area. Average score from 867 guest reviews: 8.1/10. Great location, great staff. Comfortable and clean little hotel. Staff doesn't speak much English but we're eager to try and communicate. Bathrooms were a little small (as is the norm in Europe) but were well appointed and clean. Would stay again! Stayed few days. Staff super helpful. Room cleaned every day. Towels&sheets changed dayly. Quiet for families. Fast WiFi. Very pleased. Nice clean hotel. Lady in reception very friendly and helpful. Quiet, even if bedroom was right on the road. Perfect location and pleasant atmosphere with very friendly staff. 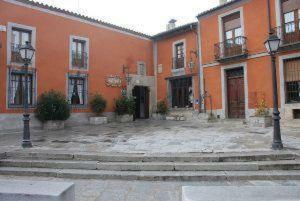 Perfect location in Avila old town centre. Modern decor in a lovely old building. Nice location, nearby parking, price for this value! It was like having a room in a hotel for the price of a hostel. A modest accommodation but a very sweet one! The Cuban Lady, an all around worker of this hostel is most entertaining and friendly. Our room was nice, bathroom way ok and we had a little balcony looking out to the cobblestoned narrow streets and the tower of a church. It was clean and comfortable. Location is perfect as it is right inside the walls of the city. Everything was great! The room was lovely and clean, the bathroom was a decent size, and it is located right in the heart of the walled city, making it extremely easy to see the walls and easy to walk to restaurants. Staff are very friendly. Hostal y Casa Rural la Colmena offers 2 traditional restaurants, a bar and simple rooms with TV and free Wi-Fi. It is situated 5 km from Ávila, a UNESCO World Heritage Site. Average score from 318 guest reviews: 7.9/10. Nicely furnished apartment. Pleasant and warm. Quiet area but close to Avila.Rubbish removed and fresh towels supplied each day. Location easy to find, quiet and rural. Room and en-suite very clean and made-up every day. Great opportunity to experience rural Spain rather than tourist areas. Self catering facilities and free wifi were excellent - accommodation overall was great. El lugar era super tranquilo y estaba en muy buena zona. El personal es muy amable, nos recibieron muy bien. Nos ofrecieron una habitación mejor a la que habíamos reservado porque estaba disponible, así que estuvimos muy cómodos. El pueblo, a pesar de ser pequeño, tiene varios caminos para hacer senderismo, y además está muy cerca de Ávila, a unos 5 minutos escasos. Volveríamos. Apartamento amplio y tranquilo con estilo rústico. A 5 minutos en coche de Ávila. Fuimos unos amigos a pasar el fin de semana. Aunque al principio estuvimos un poco perdidos y había un problema en la habitación los propietarios nos lo resolvieron de forma eficaz. Nos escantó estar rodeados de naturaleza y sobre toda la limpieza que habia tanto en el hostal como en la casa rural. Estuve muy a gusto. Habitación comoda y cálida con la calefacción. El wifi iba perfectamente, calefacción también, en el baño también, secador. Muy limpio, cama de 135cm. En el precio me entraba desayuno y en temporada baja el precio estaba genial (26 eur)pero más de 35 euros no pagaría. Ya sabía que la en el restaurante de la rotonda tenia que coger las llaves y tal, pero en verdad en coche es un minuto y a pie serían. 2 min. La ubicación y qué es un alojamiento completo para pasar el fin de semana y viajar con niños. 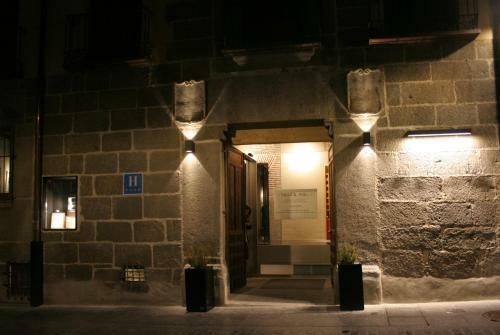 Hotel Rey Niño is located in the historic centre of Ávila, within the old city walls. The hotel occupies an old stone building, and modern facilities include free Wi-Fi. Average score from 408 guest reviews: 7.6/10. Location, lovely hotel building. Huge room. View from windows and small balcony. Very good location. Our room was very large, clean and just cool enough without aircon in July, however worth asking if room has aircon in high season. Basic facilities but it was good value for money and we enjoyed our stay. Was second visit. Location was right in the center. There is an underground car park about 300 meters away, charges about 18 euros for a day. All the city's attractions are within walking distance. Restaurants, cafes with great pastries nearby, bars etc. enjoyed our stay very much. The bed was very comfortable and the location fantastic. Ubicación excelente. Habitaciones grandes y cómodas. Sin duda volvería a alojarme en él. El trato del personal y la ubicación. Buena relación calidad-precio. El hotel no es nuevo y se nota, pero está lo suficientemente bien cuidado como para que sepas que estás en un sitio con historia sin perder confort. La ubicación era perfecta, en el mismo centro de la zona antigua de Ávila, y el precio muy barato. Nos dejaron guardar las maletas el día de salida para poder ver la ciudad más cómodamente. GIT Mirador de Santa Ana is 200 metres from Avila Bus Station and 400 metres from the Train Station. It offers free WiFi throughout and free wired internet in business centre. Air-conditioned rooms feature wooden floors and are heated. Average score from 826 guest reviews: 7.6/10. The friendlyness was really good even my friend who I travelled with is very hard to please. I found it clean and perfect to reach the old town center by foot. Even the hotel was on a main street, it was quite calm. In realation to the price, it is quite a good place and I think 3 Stars are apropriate for the hotel! convenient for rail, bus stations and easy walking access to the city. very helpful reception staff giving much detail of facilities in and around Avila. Just a short walk from the railway station. Basic bus cozy room with fair facilities. Ubicación, limpieza, personal atento. Facilidad para aparcar debido a que la zona azul en fin de semana era gratis. Si vas a hacer turismo por el casco antiguo de Ávila, es ideal el hotel. La habitación amplia y reformada, en general bien. Calidad precio muy bueno. La atención fue estupenda, muy amables y además nos facilitaron mucho las cosas ya que por un error que cometí casi mi pareja no puede quedarse, fue rápido y eficaz. El personal super-amable,un encanto,la habitacion genial y muy cerca de la muralla y demas lugares de interes,tanto de tapeo como para degustar la gastronomia de Avila. La Srta. Rocio de recepción un encanto y un trato magnifico, y demás personal del hotel. Gran Hostal San Segundo is in the heart of Ávila, opposite the Cathedral and by the old city walls. All rooms offer central heating and free Wi-Fi. 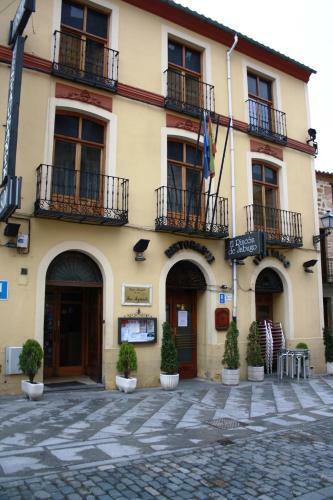 The Hostal San Segundo is set in a historic building from the 19th century. Average score from 234 guest reviews: 7.5/10. Big and clean room. 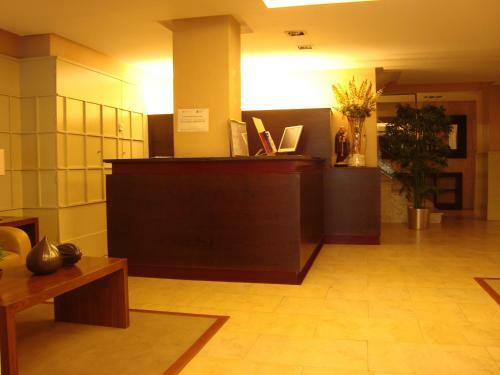 The location very good.The first receptionist very nice. Staff was exceptionally helpful and understanding if some difficulties I encountered. They were exceptionally flexible. Trato del personal correcto.Especial mención para Nora,me puse enferma y su trato fue excepcional. 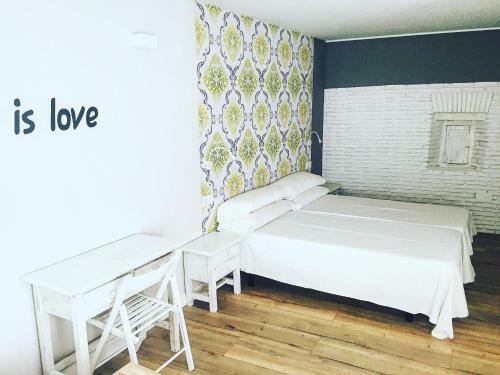 El Hostal es perfecto para alojarse,está en pleno centro de Ávila. La ubicación. La amabilidad del personal y la limpieza. La estancia ha sido genial, y la habitaciòn muy bonita y còmoda. Nosotros estuvimos muy agusto el trato y la habitación muy buenos.la presión de la ducha y lo calentita k salía sentaba genial desspues de un día de caminata.no cogimos el coche para nada 😀 TV. Bien camas y almuadas guay y desde la buhardilla c vistas a la muralla. La ubicación, la amabilidad de la Recepción, la limpieza y comodidades. Lo mejor de este alojamiento es su ubicación, en pleno centro histórico de la ciudad y rodeado de buenos restaurantes. 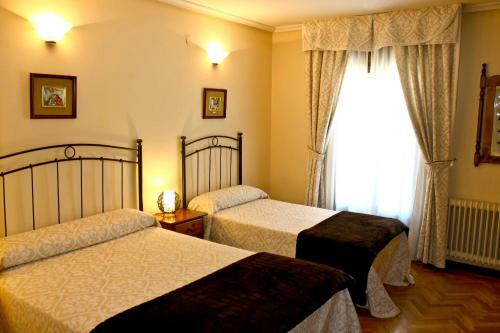 Set 2 km from Ávila’s old town, Hostal El Pinar features rooms with private bathrooms and free Wi-Fi. This guest house offers views of the city’s old walls. 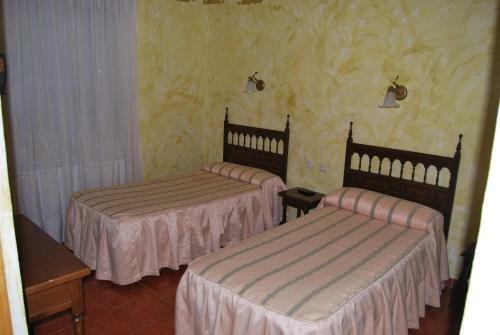 Each simply decorated room at Hostal El Pinar has heating and a desk. Average score from 519 guest reviews: 7.5/10. I liked the cleaniness and freshness of the place. The staff was very helpful and cordial. Frequented by the local Garda Civil for refreshments and refuelling vehicles, it was a 'safe' out-of-town location. Very friendly & helpful staff. Bar food was adequate (there is restaurant seating too) go for the tapas rather than the snack food. Excellent value. No desayunamos cruasans sino tostadas, y estaban bastante bién. el servicio bastante bueno, el chaval era muy atento. Respecto al alojamiento. Para mi gusto la habitación estaba de maravilla. Tenía televisión, estaba muy limpia, y las camas eran muy cómodas . realmente para el precio que tiene está fabuloso. no se le puede poner ninguna pega. La atención de las señoras. El menú del restaurante anexo. Buena cama. Aparcamiento. 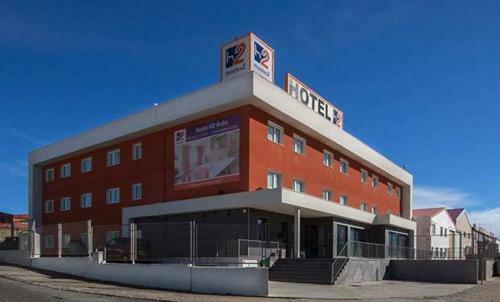 Set 50 metres from Ávila Railway Station, Hotel San Antonio features modern rooms with flat-screen TVs. There is a restaurant serving traditional Spanish cuisine. Each heated room at Hotel San Antonio has a desk and private bathroom. Average score from 55 guest reviews: 6.8/10. Good food,rooms were very cosy and comfortable,central to the train station and local buses. Varied shops,the local cake shop had an amazing selection of biscuites and cakes. The Bed was OUTSTANDINGLY comfortable!!! Their was complete silence in the room which of course is appreciated (the concern about the train station being close - out the window). The bar was very helpful even though we arrived quite late the first day. We had the superior room, everything looked very pretty but some things did not work properly, like the shower. Very good value. Staff very helpful re security parking which otherwise would have been difficult to find. La habitación con bañera hidromasaje es estupenda por el precio que tiene. Fuimos en plena Semana Santa sin saber muy bien qué tal estaba, la sorpresa es que pese a estar "un poco alejado del centro", se tarda unos 5 minutos andando, la zona es muy tranquila, muy cerquita de la estación y donde se puede aparcar perfectamente sin problemas, incluso siendo un Sábado por la noche. La bañera de hidromasaje era perfecta. Y caben dos personas. Me gustó mucho el hotel pero me esperaba una habitación mejor por lo que nos costó y por las fotos que vi. La cama muy cómoda aunque no tuvimos cama matrimonial y el baño bien. La decoración de la habitación y el hotel en general me ha encantado. Disponen de servicio de bar, cenas y comidas excelente y una muy interesante tienda donde se puede comprar artículos de decoración para el hogar. Esta a 10-15 minutos andando de la catedral y tiene aparcamiento gratuito a una calle. Muy fácil llegar y aparcar. Only 4 minutes' walk from Ávila Cathedral, Hotel Las Leyendas is set in the old town. It is a charming and sympathetically converted manor house that dates back to the 16th century. The property offers free WiFi throughout. Average score from 843 guest reviews: 8.7/10. It was in a very good location. Breakfast, at 5euros extra was excellent. Perfect location just outside the old city wall; splendid views to distant mountains. Everything. This was the most beautiful hotel I have ever stayed in. I will be going back with friends and family that visit from Chicago. I was very impressed by the staff, the cleanliness (most of all!l) and the location. Right in the heart of Avila, outside the walls. The restaurant is amazing as well. Thanks for the memory. Great location, helpful staff, and a lovely hotel for a comfortable and relaxing stay! Location of accomodation in relation to historic centre. Helpful staff, free parking close by. Excellent location by the side of the city wall Would stay again. Location was great, staff was friendly, the rooms were small but clean and cozy! Would recommend! Set on the Nuestra Señora de Sonsoles Sanctuary, Hotel Restaurante Sonsoles is located 4 km from Ávila. The rustic-style hotel offers a restaurant and free WiFi in public areas. Each heated room includes a flat-screen TV. Average score from 294 guest reviews: 8.7/10. We received a lovely warm welcome ( despite the fact that we arrived earlier than the designated check in time)and all the staff were extremely pleasant! The location was superb; just outside Avila.The room was well equipped with lovely bathroom and the bed was super comfortable with a lovely duvet.The restaurant was very pleasant and the waiter was a delight! The food was delicious, of a high quality and very reasonably priced with many options available and a fixed price menu at a cost of 16 euros! A much better quality than the tourist meals on offer in the town-the restaurant really should be patronised much more. We would highly recommend! The staff were very welcoming and friendly. The optional evening meal was outstanding both in quality and value for money. A great hotel in a lovely setting with excellent staff,and superb evening meal. They were very accommodating at this hotel. The grounds are beautiful. Very friendly and helpful staff. Excellent location outside the city. 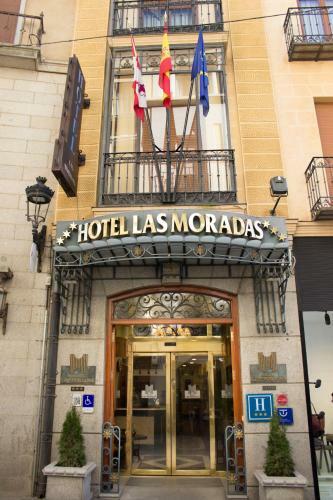 This hotel lies 20 metres from the Puerta de la Santa, a historic entrance into Ávila. 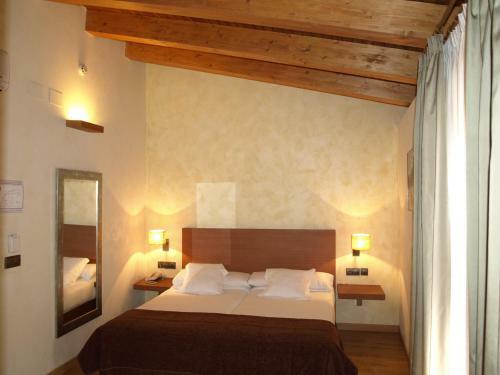 It offers free Wi-Fi and great views over the Amblés Valley, city walls and Gredos Mountains. Average score from 803 guest reviews: 8.6/10. The hotel is located just outside the walls, a perfect location for us as the street parking is close by and is easy and free. We have stayed here twice previously. A quiet hotel which is very clean and modern. A good nights sleep was had. Excellently priced, great value for money. Location was very good as next door to one of the famous wall gateways into the city. As it was in March street parking was quite easy. May be difficult in season. Staff were very welcoming, helping with the luggage and suggesting where to visit. The hotel looked very clean and smart, they obviously are proud of their hotel. No picnicking allowed in the bedroom, but they encouraged you to picnic in their cafe/bar. This was useful as they didn't have anything gluten free. Hardly any street noise. Immaculate small hotel just outside the city wall of Avila. Short 5 minute walk to town center. Pleasant room with with adequate space with comfortable bed and free wifi. Free parking on adjacent street and pay parking in garage very close. We always found space on the street. Modest breakfast can be purchased at their coffee shop downstairs. We would stay again for convenience of location and value. Everything was ok. Nice staff, quiet room, clean, good price, big room, well equipped bathroom. Excellent location right by a entrance to the walled city. We stayed here for one night during easter week. It is a small hotel with adjoining cafe/restaurant and was very reasonably priced. We were met by very polite and helpful staff and I was allowed to park my motorbike in the locked private garage. The location is excellent and the very pleasant old town is literally on the doorstep. The double room wasn't enormous, but was very clean and modern and was perfect for our purposes. I wouldn't hesitate to stop here again. A great little hotel. Everything new and clean, small hotel. Owner speaks Spanish and French. Excellent value for money. Opened in 2006, this modern 4-star hotel offers spacious, luxurious accommodation, well-equipped with all contemporary comforts and facilities, in a convenient location with great road access. Average score from 30 guest reviews: 8.5/10. Excellent location for overnight stop, bar/restaurant attached , good breakfast choice, large room. Situation of the room and contents, situation of the Hotel, a very good breakfast and the waiter in attendance and the overall cleanliness. The size of the bedroom is spacious. Large Living room, and bedroom, also a balcony. The hot water was great and strong for shower, heating is also working perfect in the cold winter! Highly recommended!!! A very big room and even bigger bathroom. I am in a wheelchair and it was all adapted and very confortable to me. A very good room and quite cheap. Staff at reception was friendly. Room exceeded all expectations: as roomy and comfortable as a parador. Breakfast was a feast. Diner was good and cheap. The hotel was very nice and the buffet breakfast was good and very reasonably priced. Spacy room, comfortable bed, quite place. Lot of free parking around. Shopping center across the street. 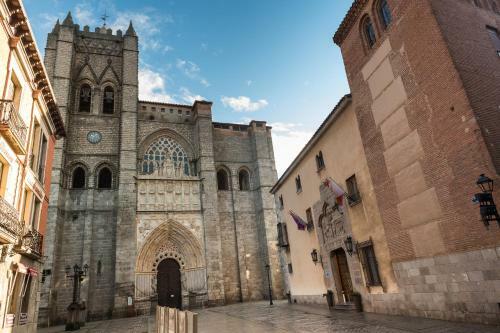 Located beside Ávila’s cathedral, this Medieval-style hotel is set in a 14th-century palace and forms part of the city’s UNESCO World Heritage Site. It offers elegant rooms and free Wi-Fi. Average score from 43 guest reviews: 8.5/10. The hotel is a former palace & retains lots of beautiful features, tastefully blended with modern facilities. The hotel is near perfect. Located right next to the UNESCO world heritage cathedral. Our room was first rate and the staff was helpful with everything. Great location beside the cathedral, beautiful hotel. Everything was perfect and the location couldnt be better! The hotel is smack in the centre of Ávila, next to the cathedral. It's spotlessly clean, and very comfortable. The interior is splendid, the rooms of a good size and the showers HOT! Excellent location right next to Cathedral. Room was very big and comfortable for the price paid. Did not have breakfast as it was not included. We have visited on a few occasions and have enjoyed the ambience of this lovely old building situated in the heart of Avila. What a privilege !! My stay was very nice. Everything was clean and comfortable. This hotel is located in Ávila’s charming Old Town, just 200 metres from Ávila Cathedral. It offers classic-style rooms with free Wi-Fi, most of which offer views over the famous city walls. Average score from 901 guest reviews: 8.3/10. The location is great, and the room was very spacious and clean. Very friendly helpful owners. Perfect location for walking the walled town and exploring without the tourist crowds. The location of the hotel is ideal for walks around the historical city. It is a family run business and they are so accommodating. The rooms may be alittle dated but ours was comfortable ,clean and suited our needs. Great location! Good breakfast (especially for Spanish standards). Enjoyed our stay here. Super convenient for exploring this historic city. Only downside is lack of parking, but street parking is not far and very cheap. (Free mid day and evenings. ).Makes a great stopover if your travelling from north to the Med. Recommend you brush up your spanish as English is a bit limited. Great location right next to the walls, easy access to tourist attractions, staff very friendly and helpful. A pleasant breakfast included. Great value for money. 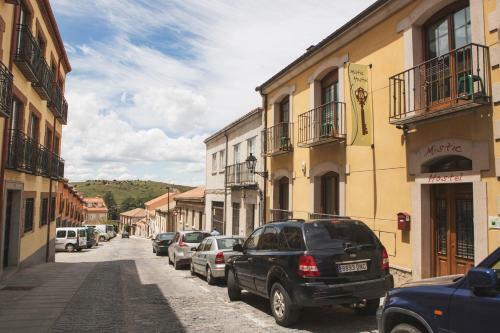 Situated next to Avila Town Hall, this guest house offers a traditional restaurant and simple rooms with free Wi-Fi, a TV and a private bathroom. Avila Cathedral is a 2-minute walk away. Average score from 562 guest reviews: 8.2/10. A very nice, stylish hotel, in the heart of the old town. Good value for money. The location is excellent...a few minutes down the hill from the Cathedral and a few more minutes down to the St. Teresa Church and Museum. And adjacent to the city's "Plaza Mayor", Well run, very clean, and has a lift to the upper floors!!! 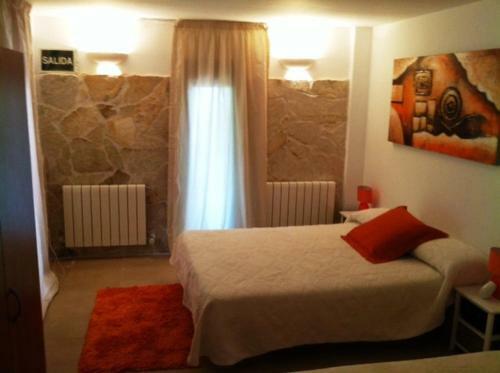 Clean, comfortable and easy to reach hostal, in a great location right in the centre of Avila. The location is great and the staff were all so accommodating. The breakfast was terrific with churros every day. The room was very big and comfortable. The hotel has a very nice decoration. location: located in the old town, near to the tourist points. the hostal boss runs a restaurant in the first floor, so it is convenient to have some thing to eat. have elevator, so don't worry about taking luggage to the room. The city itself. The location of the hostal was great, as was the view from our room. All easy, at the arrival we got the key and were in the room in 3 minutes... at the check out was the same. I appreciate not to expend time in paperwork. 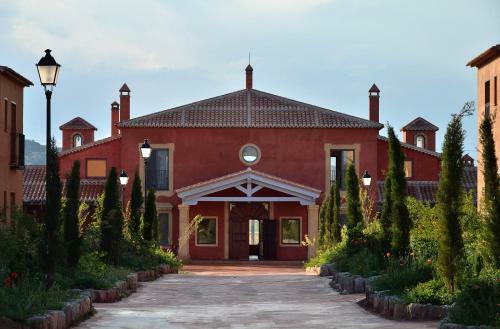 The 4-star Fontecruz Avila is a peaceful and lovely hotel located only 3 km from Ávila. Enjoy a quiet and relaxed stay in beautiful surroundings. Average score from 55 guest reviews: 8.1/10. Great rooms and friendly staff make this is very attractive hotel. Having stayed in the centre of Avila and been disappointed by noise and poor rooms I would never stay anywhere else. Great room size, enormous bed and excellent value for money. Would use again! The rooms are large and clean, a good experience and I would recommend this to other travellers.Friendly staff who went out of their way to help. Hotel was nice and very cleaned its very quiet for a peaceful break. The hotel suited our needs. The staff were pleasant and hard working The room we had was clean large and comfortable. The drive we took to the hotel is spectacular lots of bends and lovely views but could not be for anyone. Located 100 metres from the Four Columns Monument, Hostal Mirador de Avila offers views of Ávila’s ancient city walls. There is free Wi-Fi and all air-conditioned rooms come with a flat-screen TV. Average score from 171 guest reviews: 8.1/10. We had the best sleep of our trip. Comfortable beds, clean modern room, great location, quiet, friendly staff, nice views. Place was a labour of love for the lady running it. Excellent location for visiting the city,a leasent walk or short taxi ride. Within easy walking distance of one of the gates into the old town, the Hostal provided good value, clean and comfortable accommodation. The location, which is not far from the old city with excellent views of the city walls nearby, and the fact that places in which to eat and drink are also nearby. It was also good that free parking is available. Although not looking appetising from outside, inside was clean and cosy. Our room was a good size with good view of the walled town. Owner very friendly. Easy walk to best view point city walls and into old town. Easy to locate and park. Good base to walk into town across an old bridge with excellent views of city walls, particularly when lit up at night. Comfortable, quiet and good wi-fi. Friendly owner ready to offer help and advice. La cama muy cómoda. La calefacción excelente. Muy buena luz. Silencioso. Los caseros simpatiquísimos. Set next to the Four Columns Monument, Hotel Sercotel Cuatro Postes offers panoramic views of Ávila’s ancient city walls. This modern hotel offers elegant, air-conditioned rooms with a minibar and TV. Average score from 585 guest reviews: 7.9/10. Pleasant room and bathroom. Meal in the restaurant was good ,reasonably priced. Friendly check in, room with view of wall appreciated. Breakfast buffet good. Hotel was in a fantastic location, staff were helpful, rooms were lovely clean, comfortable and modern. Bed was big and comfortable...Also had a stunning restaurant next door.. I had reserved a basic room and a superior room as there were no more basic rooms available. When we arrived the receptionist imediately upgraded our son`s room to a superior one (at no extra cost) so he could be next to us. I thought that was a very kind gesture. Our room was brand new, had a state of the arts bathroom with a wonderful shower, but what we loved the most were the spectacular views of the old wall. We even had fantastic views of the old city from the loo !! It was so nice being able to park easily and free of charge as parking in the historic part of the city is a nightmare. There is a good restaurant right next door to the hotel and also a petrol station which was remarkably clean and quiet. The hotel in on the road to Madrid which made life very easy for us as we had to drive back early in the morning. Despite having the road in front of the hotel, we couldn`t hear a thing because the double glazing was excellent. We will definitely stay here again. Very nice, comfortable, and clean with good views through the window. Easy access from the motorways. Easy access into town - either walking or by car. Good value & comfort (in a modern hotel) for an overnight stay when touring. Perfectly placed for an overnight stay on our way to Santander. We have a house in Andalusia and we drive too and from the ferry port in Santander every two months. We use this hotel as our stop off point to break up the journey. It is very easy to find from the main road. It has a good restaurant, a garage for refuelling right next door. The staff are always friendly. The rooms are immaculate. The views are magnificent. Plenty of free parking. As you can probably tell, we are fans. If your situation is similar to ours and you need a good , reliable, inexpensive place to spend a night, give this hotel a try. We are delighted that we found it. Modern hotel with a perfect view of the walls of Avila. Room 401 and 402 had an amazing view. Convenient car parking area. Easy to get there and just 500m from the old town. Soundproof and great view! The hotel is located outside the city centre in a panoramic place with an amazing wiev on the Old Town. The hotel is suggested if you have a car because you can place it in the free parking and then you can reach the Old Town by foot (it takes not more than 20 minutes to reach the Cathedral but the road is uphill). Our room was spacious, clean and absolutely quiet. 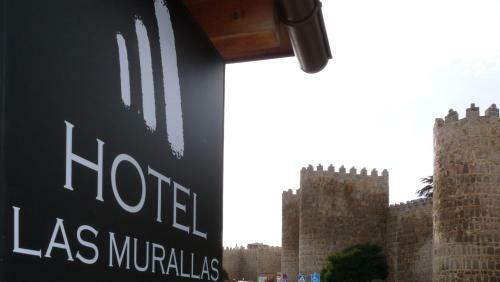 Situated just 3 minutes’ drive from the centre of Avila, this hotel enjoys views of the medieval city walls. Free parking is available on site and free Wi-Fi is offered throughout. Average score from 51 guest reviews: 7.8/10. Room very comfortable, staff very friendly and helpful, shower large and easy to access. Free secure parking. Dog friendly. Room very quiet even on New Years Eve and the hotel was full. Friendly and helpful reception, large comfortable room, excellent bed, free garage parking, reasonable breakfast included in price which was very good value. Staff was very helpful and always smiling. Complimentary bottle of water was waiting in the fridge. Good value for money. Dinners were tasty. Clean, modern. Good facilities. Friendly staff, reasonable price too. Good location and not too far from the city, with easy access on foot or by bus. Staff very professional and helpful. Big double bed ,good size room,A/C,small fridge in room, big walk in shower and good value breakfast . Very useful having large complementary bottle of water in fridge. Set opposite San Antonio Park, Don Carmelo has easy access to Ávila’s old town and offers free entry to its gym. Rooms feature free Wi-Fi and a flat-screen TV. Average score from 828 guest reviews: 7.3/10. The location extramuros allowed us to park 2 cars 10 m from the hotel entrance, and on weekends park there is free (the Hotel has his own park, too). The hotel staff told us this, thanks! Good value Hotel if you do not mind the 15 minutes walk to the centre. Everything was perfect. All the staff was very friendly and helpful (cafeteria, reception and cleaning). The room was clean and nice and the location was perfect. There were lots of free/ very cheap parking just in front of the office. The location, only 15 minutes walk from the old city walls. Easy on street parking. Good wifi signal in the room. I found the staff friendly. The room was clean and fairly large. The hotel is about a 15-20 minute walk to the center but very close to the train and bus stations. Breakfast didn't have much variety from day to day, but it was good. There is a nice hotel gym. Nos recomendaron un restaurante en las afueras a unos 400m del Hotel donde comimos estupendamente y a un precio más económico que en el centro. La habitacion era muy grande,habia un aparcamiento al lado de zona verde, 1€ todo el dia. estaba al lado de la estacion de trenes y a cinco minutos andando del casco antiguo. Buen trato del personal. Éramos un grupo grande y nos atendieron con mucha agilidad. Apartamento Losillas is 700 metres from Avila Bus Station and a 10-minute walk from the Cathedral. The air-conditioned apartment has a terrace with views over the city and Adaja River Valley. Average score from 44 guest reviews: 7.2/10. Lovely quiet location - a short walk from the main hub of town and close to all facilities. Being on the top (6th) floor - a beautiful view from the balcony. Stove-top espresso coffee maker!! :) :) :) Very comfortable bed. Trato del Propietario muy Agradable. Muy Tranquilo y todo limpio. La distribución, ubicación, equipamiento, la tv con puerto usb, y buenas vistas a la sierra. Además de que es muy silencioso y tranquilo..
personnel sympathique, serviable, appartement très bien situé, à moins d'une heure de Salamanque et Ségovie, propre. Dobrá poloha bytu, klidná lokalita. Jednoduché vybavení. La atención del personal excelente, llegué más tarde de la hora acordada y me esperaron y recibieron con mucha simpatía y amabilidad. Estudio bien situado, muy cerca de la zona monumental de Ávila, con posibilidad de garage, sala/dormitorio acogedor, aire acondicionado. La tranquilidad de la zona. Ávila es preciosísima. La cama, a pesar de su apariencia, era bastante cómoda. Un apartamento muy tranquilo, ni un solo ruido, magnífico para descansar. 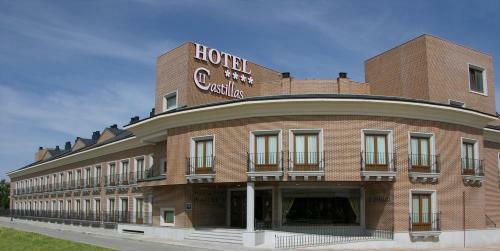 This homely Castilian style hotel is situated very near the capital of the region. It enjoys a tranquil setting and beautiful views of the Valle Amblés. The air-conditioned rooms at the Santa Teresa feature classic-style décor, free Wi-Fi and a TV. Average score from 274 guest reviews: 7.0/10. Avila es preciosa tiene mucho encanto con tanta piedra palacios y muralla el hotel estaba en unos diez minutos andando del centro monumental con lo cual el tema aparcamiento perfecto, el hotel un 3 estrellas bastante corto, cenamos un día y calidad precio mal, es antiguo sin ganas de hacer reformas, por lo demás limpieza correcta y el trato cordial y cercano, lo mejor del viaje Avila sus pueblos y sierra de gredos. Desayuno incluido muy completo y de buena calidad. Mi habitación tenía el baño recien reformado aunque era algo pequeña. La otra habitación era muy grande y aunque el baño no estaba reformado estaba bien también, además nos la acondicionaron muy bien para 2 bebés sin coste adicional. Las habitaciones tenian calefacción y estaban a buena temperatura. El personal es super amable. Se puede aparcar facilmente en los alrededores. Hora de entrada flexible y muy comprensivos. La atención del recepcionista y de las personas de la cafetería es excelente. Era muy acogedor, cerca de donde necesitaba ir, el personal muy agradable, la ducha nueva y buen funcionamiento. Hotel y habitacíon en general muy bien, algo antiguo pero eso se ve en las fotos. Habitación tranquila y sin ruidos. Las camas eran muy cómodas, la habitación estaba bien acondicionada y la atención del personal fue excelente. Apartamento Los Telares is located in Ávila's Old Town, next to the Exhibition Centre and just 400 metres from Santa Teresa Convent. 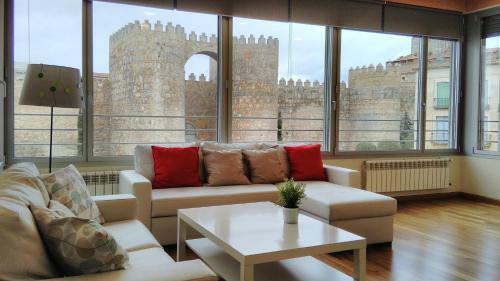 This apartment offers views of Ávila's famous city walls. Average score from 86 guest reviews: 9.5/10. Great location - inside the city walls. Apartment very comfortable and clean, sunny, equipped with new furniture and everything you need available including shower gel, shampoo, washing machine, kitchen fully equipped, there were even spices and coffee/tea, paper towel. Landlord Clotilde is a very friendly and helpful person, she stayed for 1 hour with us to explain us what we can do/see, where to eat etc. 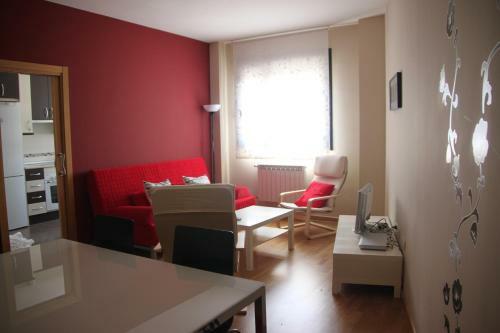 In the apartment there are documents with opening times of POI, recommended bars, restaurants. Clotilde came with her son who speaks english as she thought we didnt speak spanish, this was very kind of her. We didnt have any problem with hot water, there were 4 of us and we showered 2 people in the evening and 2 in the morning which was no problem. Would come back to this place and no other next time in Avila. We really enjoyed our stay here. The flat is in an ideal location with free parking within the old city walls and makes exploring the town and local area very easy. We were met by the most friendly owners who took time to explain everything we needed to know and made us feel very welcome. The flat was very roomy, clean and well equiped. The owners are excellent, helpful and cheerful. Apartment was perfect for our stay. Nice views out of the windows, secure and quiet. Gracias al propietario por su atención muy amable. La casa está muy bien equipada (cafetera, batidora, utensilios de cocina suficientes, cuna de viaje, sábanas, toallas, gel y champú, wifi) y limpia. La cama es bastante cómoda. La dueña nos dio mucha informacion sobre Avila.El apartamento estaba muy bien y a muy poco andando del centro.No tuvimos que coger el coche para nada. Ubicación excelente. Muy cómodo para pareja con 2 niños. Muy limpio. Excelente trato y recepción por parte de los propietarios. Ideal para conocer Ávila. 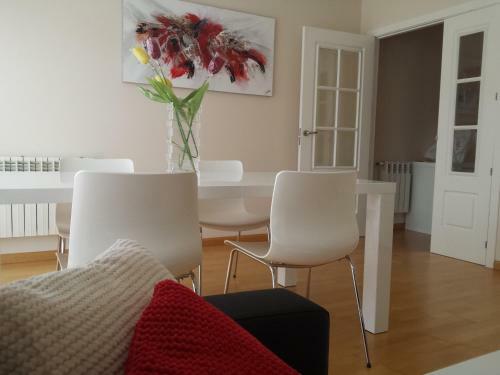 These large, fashionable apartments are located in Plaza Santa Teresa, in the centre of Ávila. They have free Wi-Fi, plasma-screen TV and balconies, and wonderful views over the square. Each minimalist apartment has a lounge with sofa and DVD... Average score from 159 guest reviews: 9.5/10. The central location was great as were the views from all the rooms. 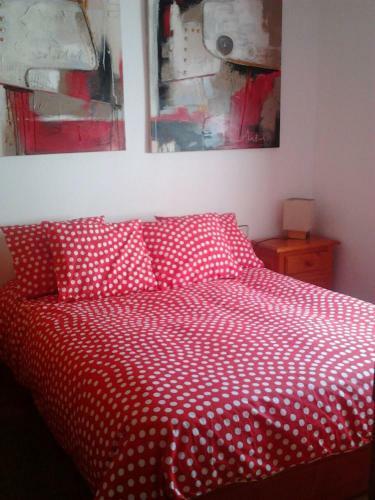 Wonderful location, clean and modern apartment, housewares, very friendly and polite hosts.. The location was perfect. Right across from La Muralla and on a main plaza with restaurants. The plaza was busy and noisy, but as soon as you closed the windows, all noise was blocked out. The apartment was clean, modern, and very nicely furnished. Highly recommend and would stay again. The location of the apartment was superb! Right outside the walls of Avila. We walked everywhere and enjoyed people watching on the Santa Teresa plaza, which the apartment overlooks. The apartment is large, bright and has comfortable couches and beds. Nice large bathroom with good hot water supply. Nice kitchen for cooking. All this and parking is available. The parking is a bit tricky but if you set your GPS for Calle las Bestias, Avila, and drive to the top of the street you will find the garage entrance. There is a bit of noise because of a road that runs underneath the building but it didn't bother us. Great WiFi signal. Uber clean and splendid location: you're right above the pedestrian square outside the city walls. And after my friend an I had been sharing a room on our travels, we loved having our own rooms! If arriving by car go into underground car park to the basement floor (not the first floor you drive into) as this is where the owner has reserved parking places. Overall apartment is quiet being in the Plaza de Santa Teresa and the bars and restaurants close at 11 pm. Excellent clean and modern self-catering apartment located in a quiet, broad plaza right beside the amazing city wall. We had a relaxing 3 nights here with a beautiful view from our 3rd floor apartment across the plaza. Well-managed by friendly and helpful staff. Short walk to Cathedral and Basillica and close to excellent restaurants, like the not-to-be-missed Bococo. The location was excellent; right by the main plaza which makes exploring the major sights convenient. The optional car park was secured and located just below the apartment. The apartment was built with a lot of nice building materials and was modern and clean. Nice view of the city square. Location is great. Espectacular vista de la muralla de Ávila desde el salón , la accesibilidad desde el aparcamiento hasta el apartamento y la proximidad a todos los monumentos, de excepcional belleza y mejor conservación, que conforman el casco antiguo de la ciudad. Trato, atención e información por parte del propietario excepcional. Si alguna vez volvemos a visitar Ávila éste apartamento será nuestra primera opción. Situated 200 metres from Castilla y Leon Tourism Office in Avila, this apartment features a balcony with city views. The unit is 300 metres from Ávila Cathedral. Private parking is available on site. Average score from 48 guest reviews: 9.2/10. View of the Plaza Teresa and the city gate. The apartment had good light because of the windows plus block out shutters for overnight warmth and quiet. The heating was excellent on a cool and windy weekend. Good range of places to eat nearby and Pedro's suggestions were very good. Beautiful apartment. Spacious and catered for 3 of us. Parking right below at a charge which was fine. Right in the centre of plaza in a secure block minutes walk away from everything. Made a pleasant holiday here. Owner english is minimum but nontheless very helpful. Loved Avila. La ubicación y la tranquilidad , pese al estar en una plaza llena bares. La amabilidad del dueño,es genial.Está muy bien ubicado,céntrico.Inmejorables vistas,con un montón de bares y tiendas al lado.Apartamento muy limpio y con muchisima luz,está equipado con todo lo necesario: cafetera,lavadora,tostadora,calefacción etc. El alojamiento estupendo, confortable, cómodo y muy limpio. Muebles nuevos y muy acogedor en una ubicación estupenda. El trato recibido la coordinación para la entrada y salida genial, volveré a repetir sin duda. Excelentemente situado, luminoso, limpio y muy cómodo. Totalmente recomendable, muy bien atendidos por Pedro, el señor que nos atendió a la llegada. La ubicación y la amabilidad de señor que nos atendió fue genial. Excelente apartamento turístico. Ubicacion perfecta para visitar la ciudad. Apartamento muy limpio, nuevo y amplio. con todas las comodidades. vistas buenisimas. Recomendable 100%. El apartamento es nuevo, espacioso, cómodo, limpio y centrico. Lo recomiendo sin dudarlo. Un apartamento muy cómodo enmarcado en un lugar maravilloso. El trato de los dueños es inmejorable. Offering impressive views of the surrounding countryside, Casa Monica is located in Narrillos de San Leonardo. The charming country house offers a furnished patio and free on-site parking. Average score from 16 guest reviews: 9.1/10. La casa está genial, amplia, limpia con buena calefacción, lpatio enorme, la dueña y la persona que entrega las llaves muy amables. El pueblecito muy tranquilo. La casa es muy confortable, completa y decoración agradable. La casa esta muy completa, la cocina con todo tipo de utensilios, varios baños, buena tele, camas comodas, etc. Tanto la dueña como la mujer que nos recibio, muy atentas. Nos alojamos 2 familias con 4 niños de varias edades. La casa está totalmente equipada con el más mínimo detalle y decorada con mucho gusto. Todas las habitaciones tienen camas cómodas. La barbacoa es de lujo. The Las Cancelas Hotel is a peaceful, beautiful and ancient inn dating from the 15th century. It is located in the old part of town, facing the cathedral and old town wall. Average score from 420 guest reviews: 8.6/10. The best location possible, in the heart of the old city, near the historical walls and the cathedral. The property has a parking lot available, very helpful for those travelling by car. They also sent us driving instructions prior to the arrival to the location. The staff is very nice even if they don't speak English very well. The room is quite big, including the large bathroom with a bathtub. Very informative video about the parking. Staff friendly and helpful. Great location for a short visit as it is only a few hundred meters from the entrance to the city wall, the main attraction. Nice big bath and comfortable bed. The staff was as friendly, effective and helpful as in the best 5 star hotel. They really made all the difference!! A truly spanish feel to the hotel. We were there 6 years ago and even more improvements have been made. A new patio has been added within the walls of the cathedral which is an absolute delight. The staff were so very helpful and friendly. Superb location with secure parking for my motorcycle. Lovely room. Courtyard breakfast area stunning. The hotel is located just inside the famous city walls near all main sites. It is basic, quaint and perfectly ok for this price and location. WiFi was workable although sometimes it used to freeze. There are no parking but this is to be expected from a small unexpensive property located in the historical center. The nearest undeground parking (150 meters, under plaza de Santa Tereza) is quite expensive - and if you're willing to stroll 400 meters more (on a smooth level surface) you'll find parking Rastro which is twice as cheap. Very helpful staff and excellent location.Loved the ladder in our room to watch the stork nests on top of the cathedral. Excellent restaurant in garden adjoining cathedral. Fabulous location inside the city walls. Friendly staff who spoke English and our bags were carried up to our room. Secure parking. The U tube video to find the car park was a great idea and worked really well. Spacious room. Lovely small hotel in a perfect location - you can see the city walls from the bedroom. Breakfast is a real bonus. An ideal place to stay in Avila. Set in the centre of Avila, just 100 metres from Avila Cathedral, the modern El Encanto Hotel & Gastro Espacio offers an on-site restaurant and bar. Free WiFi is available. Stylish rooms come with air conditioning, flat-screen TV and a minibar. Average score from 45 guest reviews: 8.6/10. Quaint hotel - very nice design. Excellent / helpful staff. Great comfortable bed. We had an excellent dinner of Salmon and Sea Bass. Eggs cooked to order for breakfast. Perfect location. Great location and a beautifully modern hotel. The suite we had was very spacious and even had its own patio area. The location was absolutely perfect, within the city walls. Staff were incredibly friendly, and went out of their way to make our stay enjoyable and educational. Really large & extremely comfortable, great sized rooms & very interesting & historic architecture in the rooms & the rest of the hotel. Right in the center of the city with a parking nearby. 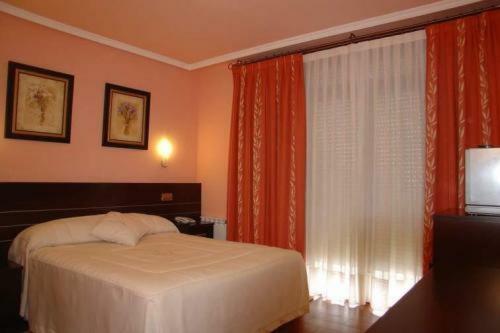 Perfect place, right in the centre of the old town, clean room, bathroom excellent. Private parking available on request. Apartamento Losillas 2 is centrally located, 2 minutes’ walk from Avila’s city wall and a 5-minute walk from the Cathedral. Each heated apartment has a large furnished patio. Average score from 88 guest reviews: 8.4/10. We got a bit lost trying to find it the first day, but the owner kept in touch with us by text and even came out in his car to find us. The location is wonderful - easy access to all of the sites. The kitchen is well-equipped, the bed is very comfortable and in the summer the courtyard off the bedroom would be a wonderful place to sit and enjoy a cold drink. A very warm and informative welcome from the owner. Only a short five minute walk up to the old town. Quiet apartment with parking always available within a 100 metre or less. Comfortable and well appointed. The apartment was spacious and clean. It had all the facilities we needed with our 2 small children. It was near 2 supermarkets and just outside the walls of Avila old town. Gabriel was responsive to emails prior to arrival and welcoming and helpful when we checked in. We had an amazing time exploring Avila during our stay. And got very fit walking all the narrow, hilly, cobblestone streets and lanes! We could walk from the apartment to the walls of Avila. Accommodation was clean, quiet. Very large TV screen. Short walk to the old town. Excellent wifi. Free car parking in the plaza by the apartment. Modern apartment. El apartamento nos encantó. Estancia de 10. Volveremos a repetir sin duda alguna. La ubicación en pleno centro. El apartamento genial muy cómodo y espacioso. Tiene de todas las comodidades y una tv enorme. Located in the historic quarter of the charming town, this 16th-century Palace has been beautifully renovated and stands within pretty gardens – enjoy meals in the fabulous restaurant. Average score from 761 guest reviews: 8.4/10. Location and Parador quality in general; very historic setting, close to major points of interest. Excellent breakfast choice and very comfortable room. The staff were very friendly and helpful. Staff were in the bar and restaurant were fantastic. Room extra large and extremely comfortable. Excellent parking and so very close to the town centre. The general ambience, helpful staff, location and lovely breakfast. We booked a superior double for 3 nights, lovely room overlooking the garden , bed linen & towels changed daily, very friendly & helpful staff. The location was perfect! Parking was great and easy to find. Wonderful paradore in a stunning historical setting. The hotel is situated in the centre, 100 metres from the train station and 400 metres from the walled historical quarter with all its attractions. The comfortable rooms are classic and well-equipped with little extras such as a pillow menu. Average score from 442 guest reviews: 8.1/10. The hotel was very clean and comfortable and within walking distance of the old town and ramparts with lots of restaurants nearby too. The approximity of the train station. Friendly staff. Cleanliness of the room. Llevo varios años subiendo a Avila y menos uno que no había habitación siempre reservo allí,lo más que puedo decir que yo personalmente no le veo ningún fallo,lo único por decir algo es el llamar allí y no tener habitación y tener que reservarla a través de alguna agencia por lo demás todas las veces que tenga que ir a Avila si me puedo alojar allí lo haré. Las instalaciones del hotel y el personal de servicio. El Hotel esta superbien ubicado, muy cerca del centro historico, es confortable, de estilo clásico, todo muy cuidado y limpio, sin ruidos. Casa Telares is located within the walls of Ávila, 500 metres from the Lienzo Norte Conference Centre. It offers spacious apartments with views of the city and the wall, and free parking. Average score from 26 guest reviews: 8.0/10. Great location. Plenty of free parking nearby albeit without shade. Gracias a María José por habernos facilitado la estancia, tu amabilidad y resolver cualquier problema con la máxima celeridad posible. Fenomenal alojamiento. Mucha amplitud. Una gran casa dentro de la muralla para disfrutar unos días de ávila. Muy buena ubicación. Vivienda amplia y bien organizada. Tres habitaciones y dos cuartos de baño (uno por planta). Menaje completo. La chica que nos atendió, María José, fue muy atenta y servicial. Todo muy limpio y casa muy espaciosa. El barrio, aunque dentro de la muralla, es tranquilo. Fué facil recoger la llave en un hotel cercano y la propietaria es muy simpática. La situacion dentro de la muralla inmejorable, no está en el centro por lo que evitas jaleo. Casa limpia, bien ubicada y con espacio para toda la familia. Cocina muy bien equipada. Buen trato y facilidad al llegar e irnos.Sin problema para aparcar en la misma puerta.Justo al lado de uno de los accesos a la muralla. El sitio es una maravilla, te permite estar cerca de todo y al mismo tiempo muy tranquilo. These modern apartments enjoy an excellent location in the centre of Ávila. Each comes with a flat-screen TV and a well-equipped kitchen. Free Wi-Fi is also available. Each apartment in the Apartamentos Soterraña has been decorated in a unique... Average score from 193 guest reviews: 7.9/10. The apartments were clean and comfortable, and well-priced.They were a great base from which to go out each day. Not luxury, but good for families and tourists. Fairly good walk to the walled city for restaurants and sight-seeing. Interesting place with decent space spread over two floors and a balcony on each floor. Me gustó todo,la cama muy cómoda la cocina muy limpia y el piso muy limpio también,la recepción esta bien también. El apartamento está bien ubicado, a un paso de la muralla y es fácil de aparcar cerca. Tiene prácticamente de todo para una estancia corta. El mobiliario no es antiguo, correcto. Llegamos al apartamento por la tarde/noche y nos habían puesto la calefacción desde por la mañana, lo que se agradeció muchísimo porque se estaba muy bien. Son pisos bastante nuevos, acogedores y con conford. This rural hotel offers an outdoor pool surrounded by gardens with views over the Paramera Mountains. Hotel San Miguel del Valle Amblés is just 7 km from the beautiful walled city of Ávila, while Madrid is just over 100 km away. Average score from 236 guest reviews: 7.7/10. Very close to Avila by car. I went with the family so it was perfect to rest and quiet. Staff very friendly. Large room. Ample parking. Friendly and helpful staff. Only 10 minutes from Avila town center. Received email with detailed map to find the place - this was essential as it was not on my satnav database, and the street address didn't work either. Sa situation tranquille. La distribution des logements, petites maisons au lieuy d'étages ! l'environnement intérieur bien arboré. Le parking avec un portail. personnel aimable. Trés bel hôtel ! Muy buenos servicios, parking y wifi gratis, hotel rodeado de preciosos jardines. Muy bien indicado,hay q llegar por la N 110, además desde el hotel te mandan un plano al email (son muuuuyy amables y se preocupan x sus clientes). Excelente localización para tener una estancia tranquila y acogedora. Muyyyy recomendable. Habitación muy limpia, grande y confortable que estaba muy calentita cuando llegamos, además no se oye ni un ruido. Muy buena relacion calidad precio en todo (restaurante, desayuno, etc).Personal muy agradable y atento. Y la ubicación (que fue nuestra elección) es perfecta, muy cerca de Ávila y en el campo. La tranquilidad y las magníficas vistas. La habitación grande y limpia. La calefacción y el agua de la ducha calentaba rápidamente. Los jardines bien cuidados. Y el parking grande y gratuito. Nos gustó lo bien cuidado y limpio que estaba todo y que salías del hotel estabas en pleno campo y a 10m de Avila en coche. Todo muy bien, paz y tranquilidad a un paso de Avila. El personal encantadores, habitacion muy limpia, bonita y grande.Desayuno y menu de dia muy ricos. Todo perfecto. 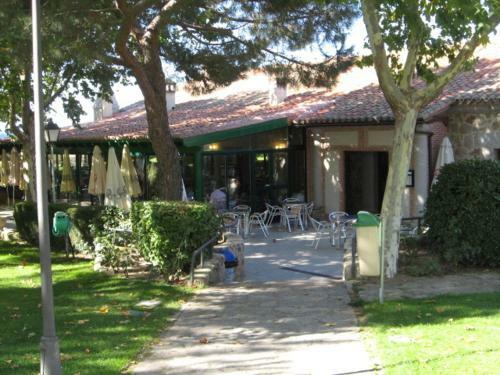 Avila Flats Soterraña Plaza del Rastro is a self-catering accommodation located in Avila. Average score from 64 guest reviews: 7.6/10. Excellent location in old town, large and clean suite with good construction and a view, comfortable bed, plenty of hot water, sufficient heating, snow-white towels, quality kitchenware, fast Wi-Fi. Location, very close to sights and good places to eat. Very well equipped flat especially the kitchen. Friendly staff took us to apartment by car from where we picked up keys. Comfortable small apartment inside the city walls. Close to all places of interest. Secure private parking. Ya conocía el lugar, por ello regresé. Y regresaría con todo gusto. La ubicación es perfecta, y la casa esta muy bien y acogedora. La cama muy cómoda, el sofá cama un poco incomodo. Para estar situado muy cerca del centro no se escucha apenas ruido. Con una cocina pequeña pero en la que puedes hacer de todo con una cubertería muy completa. La verdad que para pasar unos días y conocer la ciudad sin gastar mucho esta muy bien. La ubicación, en pleno centro, pero muy tranquilo, no se escuchaba ningún ruido. La calefacción funcionaba perfectamente, aunque los cierres de las ventanas no ajustaban bien. La tranquilidad, la situación del alojamiento. La amabilidad de Nuria y Fani. Avila Flats Soterraña "Plaza del Ejercito"
Set next to San Roque Park in Ávila, Avila Flats Soterraña "Plaza del Ejercito" offers simple, well-equipped apartments. All accommodation at this property has heating and a kitchenette with a washing machine. Average score from 58 guest reviews: 7.4/10. 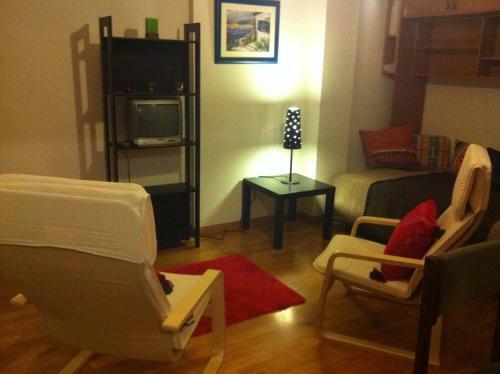 Good location - very close to Plaza Santa Teresa, which is very convenient. Sitio: ideal.Aparcamiento:tuvimos suerte con la zona azul.Piso: Buena calefaccion, camas cómodas.Laura: simpática y eficiente.Volvería con los ojos cerrados! La amabilidad del Félix, el señor que nos recibió. Era un piso muy grande y con muchos instrumentos de cocina. Квартира находится в центре, что очень удобно. Есть парковка - платная. Есть лифт. La casa está muy cerca del centro, es grande y está bien equipada. These comfortable apartments are located in a quiet, residential area, 5 minutes’ drive from the centre of Avila. They offer stylish, heated accommodation with shared gardens. Average score from 156 guest reviews: 6.8/10. The position was okay, as there was some nice walks from the property. Not too far to drive to get to town and the shops. Apartamento muy amplio, luminoso, moderno y bien ubicado en las afueras. Fácil aparcar. Muy buena calefacción radial. La amplitud del apartamento y tranquilidad de la zona. Cercano a centro comercial y escuela de Policía. La ubicación, lo escogí por estar detrás de la escuela de policía y poder regularme los horarios para la cena y el desayuno previo a las pruebas físicas (y así no depender de la comida y horarios del hotel de alojamiento), y salió perfecto. La amplitud de los ambientes, el paisaje y las vistas desde todos los ambientes son de lo mejor las 3 terrazas y la decoración es muy agradable. Замечательное место для кратковременного пребывания. Часть нового коттеджа с отдельным входом. Все удобства. Недалеко от автотрассы. 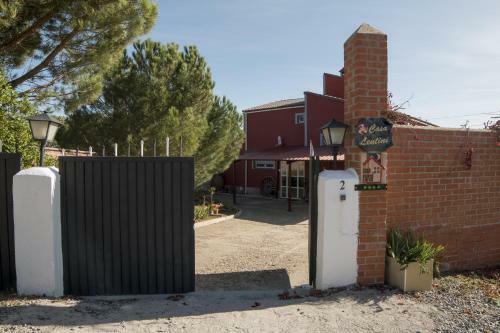 Offering a terrace with barbecue facilities and a garden with sun loungers and children’s playground, Casa Lentini is located in Martiherrero village in Amblés Valley, 8 km from Ávila. Average score from 10 guest reviews: 0.0/10.